Decision Science News was just at the ESMT Annual Forum in Berlin where we spoke in a session with Martin Weber, Gerd Gigerenzer, Stephan Meier, Luc Wathieu and Robin Hogarth and suddenly remembered that Hogarth, along with INSEAD’s Spyros Makridakis and Anil Gaba, has a new book out called Dance with Chance: Making Luck Work for You . Take a chance on me from Chapter 8: Does God Play Dice? Blinking marvelous from Chapter 11: Genius or Fallible? Also fun is this video of the authors chatting with Nassim Taleb. Anil Gaba makes a point in the video which, coincidentally, was Decision Science News’ thesis in our ESMT Annual Forum talk on navigating turbulent times. 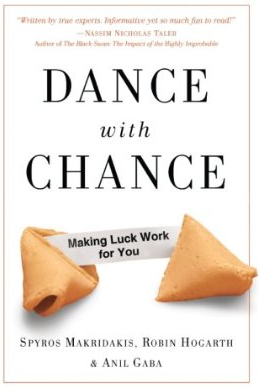 Dance with chance was written on July 6, 2009 and filed in Books.